Poll: Should citizens in the North be allowed vote in Irish presidential elections? The next presidential election will be in 2025. 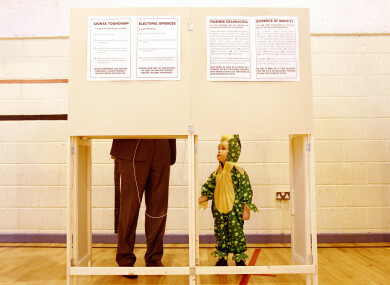 Daniel McGuire dressed up for his third birthday watches as his father Micheal casts his vote in Galway in October, 2011. DO YOU THINK Northern Ireland citizens should be given the right to vote in Ireland’s presidential elections? According to the Sunday Business Post, the government is preparing legislation for a referendum next May on whether 1.8 million people in Northern Ireland should be given the vote in Irish presidential elections. The amendment would also allow 1.7 million Irish citizens living abroad to vote in the next presidential election in 2025. So what do you think? Should citizens in Northern Ireland be allowed to vote in Ireland’s presidential elections? Email “Poll: Should citizens in the North be allowed vote in Irish presidential elections?”. Feedback on “Poll: Should citizens in the North be allowed vote in Irish presidential elections?”.